A woman who was struck and killed by a bicyclist on Page Mill Road on Monday morning has been identified by the Santa Clara County Coroner. An official cause of death has not yet been determined. Kathryn Green, 61, of Los Altos Hills, was crossing the road when she was struck by a bicyclist traveling downhill. Police and emergency personnel responded to the scene at 11:02 a.m., California Highway Patrol officer Art Montiel said. The male bicyclist was riding eastbound on Page Mill Road near Foothills Park at about 25 mph around a blind curve when he struck Green. There was no nearby crosswalk. She was transported to Stanford Hospital where she later died. The bicyclist sustained minor injuries, mainly scrapes and cuts, and was transported home by one of the responding officers. He has not been charged in the incident, Montiel said. Police closed Page Mill Road between Altamont Circle and Moody Road in the area near Foothills Park for about one hour, Montiel said. This is terrible. Condolences to the family. What a tragic incident. I am sure the bicyclist didn't intend to hurt anyone on his/her ride that day. Initially they were unable to identify the patient because she didn't have an ID. It is always good to have some form of identification on you. I recommend www.roadid.com I wear one on my bike rides, hikes and walks! Downhill bikers, yes they are putting their lives and other peoples lives in danger. I can't tell you how many times we encounter the speeding downhill bikers on the Page Mill road. They are very fast indeed, and they usually go over the cross traffic lane to cut corners (probably at that speed, that's the only way they can make the turn). BUT, this is very dangerous. It gives us hearth attacks every time. Please bikers, be cautious, very cautious! I respect your right and right of way, but please do not be so aggressive on the road. Don't forget You are not only putting your life in danger, but also you might end up giving other peoples a burden to be carried for a lifetime in case anything happens to you. My condolences to her family and other loved ones. What an avoidable, horrible tragedy. Bicyclists don't follow the rules of the road. Many cyclists like roads like pagemill to prepare for bike events in the area and go prety fast on downhills and dont stop or follow the road rules like they aere supposed to. Around the schools, the kids go out into the travel lanes to pass other kids without even looking to see if there is a car there. They dont stop at stop signs either. We need more education and enforcement on riding. "not in a crosswalk"? Duh - this is in the country, not town. Why is mention that the woman was not in a crosswalk of any relevance here? Because a pedestrian in a crosswalk has right-of-way over a vehicle such as a bicycle. Where there is no crosswalk, a pedestrian may not have right-of-way over a vehicle. And fault/blameworthiness, if any, may turn on which person should have stayed out of the path of the other. You can't ask bicyclists to slow down on narrow roads. Then they will be sitting ducks for cars, who realistically will never slow down. This woman could easily have been hit by a car instead of a bicycle, since cars generally go faster on these roads and cars are bigger so have less visibility of the road and less maneuverability. What the city needs to do is paint a crosswalks to tell pedestrians where safe crossing zones are near the park, and also tell passing vehicles where to look for pedestrians. I am a cyclist and a pedestrian, and I've descended Page Mill road dozens of times on my bike, and I know this section of road particularly well. 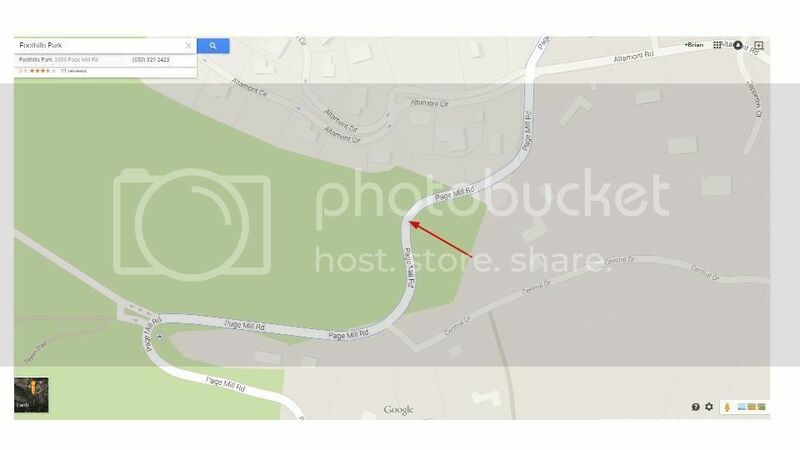 Given that the article states that the accident occurred at a blind corner, I'm going to guess that it was the hairpin turn you see on the map in the article, right at the Foothills Park entrance. This corner is particularly challenging as there is a step angle of turning as well as descent. It is tough without a pedestrian involved. I personally know two people who have crashed that turn, without anyone or anything else involved. That being said, I feel bad for the pedestrian's kin but I also feel bad for the cyclist. Knowing that stretch of road as I do, I believe it was a genuine accident with two good people in the wrong place at the wrong time. I'm a daily bicycle rider, and I believe that if this cyclist was going 25 mph around a blind curve, that qualifies as traveling at an unsafe rate of speed for the conditions. I would say the same thing if it were a motorist who hit and killed this women. This is a tragic situation and my heart goes out to the family. I too have biked down Page Mill by Foothills Park. There is lots of speculation going on here by non-cyclists as we don't know exactly where the woman was when struck. There is no way the biker was going 25mph around this turn. You have to slow to below 10mph to make this turn or you would fly off your bike. I have looked over the route between Moody and Altamont Circle and can't determine where the crash took place - there only two other "blind curves." I can, however, determine there is NO safe place to cross the street. Again, I am very sympathetic for the tragic loss of life, but it seems clear the biker was not at fault. Yes, there are bikers that go too fast and take risks on descents, but this seems to be an isolated case where a pedestrian made the mistake of crossing at a very dangerous "blind curve." I agree that it was just as likely that the woman would have been struck by a car. In fact, a bike is much more maneuverable than a car in this situation. Not all people on road bikes are bad. Many of us take care as we ride. I am compelled to post here b/c this could just as easily happened to me and am very dismayed by all the calls to vilify the biker when we don't know all the facts. As a person who is among the close friends of the victim, I can assure you that there has been no sense of finger-pointing or blaming. Surely human error was at fault...one way, another, or both.... but this was a tragic accident. There is no sense of wrong doing or flagrant disrespect for law or safety. Poor choices or decisions happen everyday to all of us, and many good decisions, too. We are humans. My heart goes out to the biker, as it breaks for the loss of my dear friend. Bicycle enthusiasts tend to under-estimate the hazards they present on the road. As a driver I have to be super vigilant so as not to hit a bicyclist. It is a serious problem, but ignoring the hazard does not help. One thing I would like to point out, is that people tend to hear if a car is coming (unless they are Prius or Tesla) but bikes are silent. Silent vehicles are much harder to predict than noisy ones. Why is everyone so quick to blame? Obviously this was a tragic accident and my heart goes out to the woman's family as well as the biker. If a car had come around the corner she would probably have been hit too. Stop trying to lay blame as I'm sure no one intended this to happen. Many who post on this site (on this and other matters) are always looking for villains and someone to blame. What's your solution, no biking? no cars? no pedestrians? more regulation? more enforcement? 1. Do we know if she was actually crossing the street or was she just walking on the side of the road? 2. Under California vehicle code any intersection is legally a crosswalk and vehicles are required to stop for pedestrians whether or not it is marked. See California Vehicle Code 21950. Just yesterday I was driving down Channing in the left lane, with a bicycle just to my left as a women began to cross Channing at Emerson where there is no marked crosswalk. I stopped for her, the bicyclist did not and just missed hitting her. A car to my immediate right also did not stop. It seems very few people follow this law and many may not be aware of it. Speeding downhill on a bicycle, motorcycle, or car is dangerous, period. That particular stretch of road has an extra danger: houses, and the driveways that go with them ( not to mention residential cross-streets). Three years ago, while motorcycling down Page Mill, in the hills, I was unfortunate witness to a terrible fatality. A man in his early 70s, very fit, sped past me going well in excess of 25 mph. On the other side of a blind curve, a homeowner backed his car slowly out of his driveway and the bicyclist, having NO time to react, impacted the passenger side of the car. His body careened over the car and landed VERY hard on the other side, several yards away from the car itself ( due to the speed at which the bicyclist was traveling). I believe he was dead on impact with the ground, but it took a LONG time for the Stanford Life Chopper to arrive. No one at the scene had cell phone service, so all of our cell phones were useless. The homeowner's wife had to call 911 from her landline, since her husband was in too much shock to move from the scene. The victim was pronounced DOA, according to the Sheriff's Deputies who took nearly two hours to arrive due to the traffic and bicycles riding in large clusters on Page Mill ( ride single file, please--it IS the LAW). Of course, those of us who witnessed this horrible tragedy had to wait for the Sheriff's Dept, and each give our accounts of what we saw. And what I saw haunts me to this very day. It was about a month before I could sleep well again. It could have happened to any of us. Incidentally, I have not ridden on Page Mill on my motorcycle or bicycle since, and I have come to believe that if the road is so narrow, as upper Page Mill is, that there is NO ROOM for a bike lane, it is unsafe to ride a bicycle there! Oh it is so much fun to play the blame game! Pedestrians need to be more careful. But here, a lady is dead and a cyclist is most probably devastated at what happened. Blame game will get us nowhere since there are some people who value safety and some people who don't. Generalizations won't help. So let's figure out how to improve safety at that curve near Foothill Park because I have heard of multiple incidents there. 1 - First my deepest condolences to both parties, their families and friends. 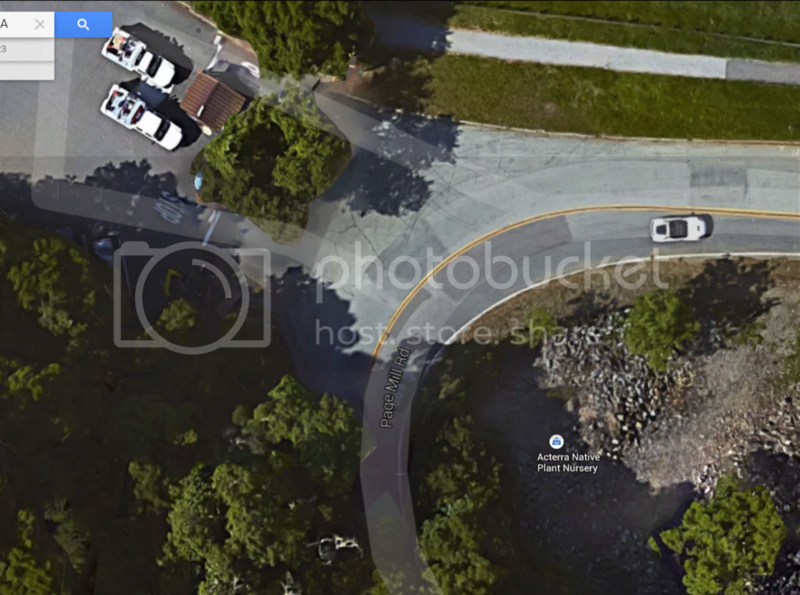 2 - The accident actually occurred at a hairpin turn NOT at the park entrance. This one is between Foothills Park and Altamont. There's a "path to nowhere" at this location. The path leaves Foothills Park, follows Page Mill for a couple of hundred yards, then ends abruptly at Page Mill. Pedestrians are dumped in a blind corner with nowhere to go except to walk across or down Page Mill to connect with a different pathway well off the roadway on private property. Dangerous as all heck. Whoever put in this pathway was not thinking straight because LAH residents aren't allowed in Foothills Park anyway, so really there's very little use for a pathway leading out of LAH and to the Park. 2 - Drop the "crosswalk" argument, people. Page Mill is a country road without crosswalks, so this is a spurious argument. Persist in making the spurious arguments, and you might find that crosswalks, stop signs, speed bumps, or traffic lights might be added. if that's what it requires for people who hide behind legalisms to ride and drive safely. 3 - As someone who's been close enough to watch traffic passing on Page Mill Road for 17 years now, I can tell you that things are getting worse and may reach a crisis point soon. Page Mill was not designed to handle the hundreds of bikes, motorcycles, togue racers (look it up, they post their late-night videos online), pedestrians and equestrians that use this ancient logging road on a daily basis. The number of bicycles, in particular, has spiked in recent years. They're out here all the time, dawn to dusk, weekends and weekdays. I predict more injury accidents are in our future before action is taken. To make things worse, jurisdiction out here is unclear. Try to report a traffic event and Los Altos Hills points to CHP, CHP points to Santa Clara County, Santa Clara County points to Palo Alto, and Palo Alto points back to Los Altos Hills. This is a terrible accident. One of the issues with bicyclists traveling at speed is they are quiet compared to a motorized vehicle and are upon you before you are aware of them. This impacts pedestrians, hikers, horseback riders and other bike riders who frequent the hills. Is there a way for bicyclist to give an alert when they are rounding a blind curve? My condolences to Kathryn's friends and family. I just saw her at the Farmer's Market in passing (didn't stop to say hi) on Sunday. She was a client of mine for many years in the 1980's. I still have a carved wooden bird she gave me in a plant in my studio. I'm so sorry for your loss. The bicyclist goes home and will say what most automobile drivers say when they come close to hitting a bicyclist. No laws will have to be changed because it will be called a fluke. IF IT WERE A CAR HITTING A BICYCLIST…. GUARANTEED IT WILL CAUSE A STIR AND LAWS WILL BE ADDED FOR BETTER SAFETY FOR THE BICYCLIST. I wasn't there, but try to read the bicyclist as a car and the poor lady as a bicyclist. The bicyclist at time come so close to me when I'm running that I can feel the wind. It's all luck they don't hit me. I am also a friend of the lady who has passed away through this accident. Without knowing all the details, I expect this is exactly what it was - a tragic accident. Maybe she could have done something differently, maybe the cyclist could have. Whatever the "might have beens", Kathryn is no longer with us, and I am sure the cyclist is devastated. It would be good if something positive could come from all this, even if it just all of us as pedestrians and/or cyclists (and drivers) thinking a bit harder about what we are doing when we are out and about. Thank you Michelle. My thoughts exactly. Bikes could use bells, that old technology that nobody seems to use nowadays. Very distinctive sound and much better than shouting out. All bikes should have lights and bells, imo. This was indeed a tragic accident. With so many aggressive cyclists in the PA/LAH area, it's easy to decide the bicycle was at fault, but not necessarily the case. I know this route well, and know that too many fellow cyclists overestimate their skills and response time. I nearly perished in a self-caused speed accident further down this path, remembering the impact and sound of my unexpected crash, as if it happened yesterday. I'm not placing blame here, as over the years I've narrowly dodged pedestrians who didn't seem to have a care in the world. It's up to everyone to be aware at all times, but for now to consider those who have died or been injured. 1 - Sensors at key points on Page Mill Road. Bike passes through sensor and a noise sounds. And/or pedestrian pushes button and lights blink ahead of the intersection to warn downhill traffic. All bikes required to be registered and install sensor. Ticketed for violation. 2 - Widen Page Mill at key points. Sure it requires cutting into hillsides but hey humans cut into those hillsides 150 years ago to build the road in the first place, so is it rocket science? Given how much of Page Mill is Open Space preserve, you won't even have to pay residents for their land. 3 - Pedestrian bridges and key places. Someone mentioned that online yesterday. Up and over. 4 - Build a bicycle park in Open Space lands where the yahoos of the biking world can go wild. Then ban them entirely from Page Mill. Twenty years ago when I was biking Page Mill, I actually rode from my home. Now most bikers drive their cars to convenient put-in spots. Driving to the bike park would not add much time to the outing. Folks I generated this list in about 2 minutes Surely other smart people can come up with more and/or better. Let's do it! This is heartbreaking. I am very sad for all involved, and yet the more I read these comments the angrier I become. [Portion removed.] I was walking at Shoreline with a friend and a bicyclist struck her and knocked her down. The cyclist showed no remorse at all. We were in her way. All she cared about was her kid that was riding on the back. As a road cyclist myself, I have descended page mill multiple times. A problem with page mill descend is the grade percentage varies a lot. If you are not very familiar with the road itself, it is easy to misjudge a turn or fail to brake in time and go over the central divide -- because the speed suddenly picks up. Also, a catalyst of reckless descending behavior is Strava. Many type-A personality cyclists would chase the KOM records at all costs. The current Strava record of Page Mill descent is not 25mph, it is 36mph. At a point this fellow was hitting 60mph. Yes, it is unfortunate. Yes, it is hard to control the bike at 25mph. But they are not the right reasons to run into the pedestrian. Cyclists should descend within their ability. If I can dodge a huge deer on my way down on Montebello, I think you can, too. The cyclist did nothing illegal, that is why he was not cited or arrested. The woman [portion removed] walking out of a crosswalk on a blind turn. The cyclist was obeying the speed limit, riding as they should within conformity of all laws. The cyclist was not criminally negligent. They were likely not civilly negligent or reckless. It obviously wasn't intentional. You can't assume this cyclist committed a crime because you have seen cyclists break traffic laws in the past. I see cars speed on the highway. It doesn't mean that all cars speed all the time. (1) This location is where the foot path runs out, right at the apex of the turn. This is right at the Palo Alto city limit, and likely the path was forced to end at this location because Los Altos Hills would not let the path continue into their territory. There is a path on the other side of the road here, so the pedestrian is greatly tempted to cross the road right at the Apex of the turn instead of turning back. It is hard to imagine a design that would do any better to maximize the risk of collision at this corner. You often see problems like this at city boundaries, because cities historically do a poor job of working together on issues at their boundaries. (2) To makes matters worse, Palo Alto planted a row of trees right next to the inside of the turn, thus completely blocking the sight line for this turn. Los Altos Hills has recently planted another row of trees on their side of the turn, which will only extend the sight line issue. The location of the tree planting so close to road at the apex of the turn was unnecessary, as there is plenty of room to have planted them with a setback. (3) A speed survey would likely show that cyclists and motorists take this corner at similar speeds, and motorcyclists even somewhat faster. There are an increasing number of electric cars on the road, which produce much less noise than motorized cars, especially at the lower speeds around low radius turns. Hybrids traveling downhill will also be silent. The Pedestrian Safety Enhancement Act of 2010 called for an electric and hybrid vehicle simulated noise standard to be set by mid 2012, but the automotive lobby successfully pushed back the ruling until later this year, saying it would be too expensive for them, meaning it will actually not take effect until 2018 (unless it gets pushed back even further). A similar rule requiring cyclists to use a bell upon entering hairpin turns seems reasonable. My suggestion. Write both Palo Alto and Los Altos Hills and ask them to work together to fix the road design and path design issues at this corner, address how and why the path ends at this location, and address the vegetation induced sight line issue. Also urge Palo Alto to adopt Vision Zero, and take a more proactive (instead of just reactive) approach to reducing VRU collision rates. This is a tragedy for all involved and for all of us. We must learn to share the road. Pedestrians, cyclists and motorists MUST follow the rules. Most motorists and bicyclists do so but not all. I am both myself as well as a pedestrian. It seems to me there are many cyclists who don't consider their bikes vehicles. Many of those kind of cyclists don't stop at stop signs or even lights and seem to think the rules don't apply to them. The rules of the road help us figure out what to expect of each other. I, for one, don't want to assume entitlement and arrogance by anyone I encounter on the road. No one should walk, ride or drive loaded for bear. Tony nailed it - "I believe that if this cyclist was going 25 mph around a blind curve, that qualifies as traveling at an unsafe rate of speed for the conditions." As I said in the first article on this, put a crosswalk AND stop signs here and warning signs 100 feet uphill and downhill of this spot, otherwise people will just ignore the stop sign. This particular location is where a lot of people will be and it is blind to drivers, riders and pedestrians. But also, I have to disagree with a lot of comments about about bicyclists. I have noticed a big turnaround in bicyclist behavior. Most of them now stop at stop signs and behave very carefully - in town. I usually wave bicyclists on through if we arrive and an intersection anywhere near simultaneously. It is sad to see a group of people pile on comments that simply are not true just to attack bicyclists. Condolences to this woman and her family. 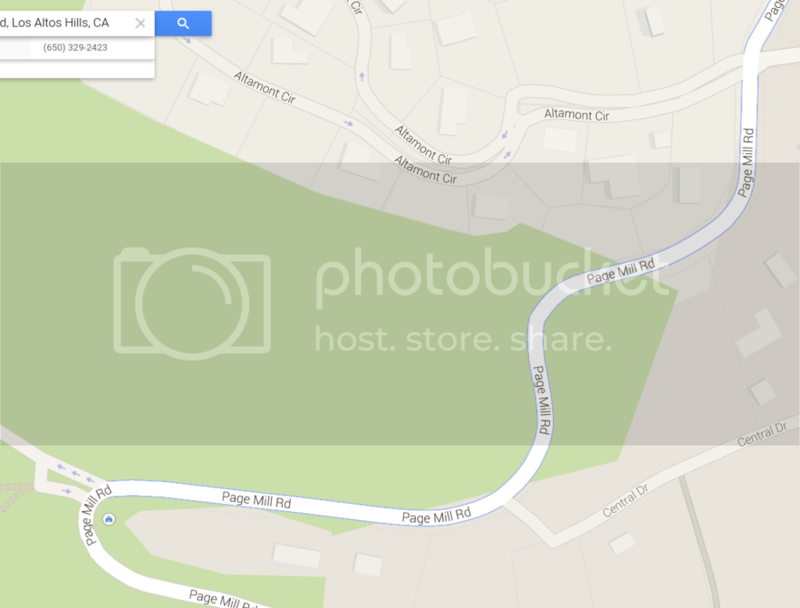 FYI, this is the location, with the path intersecting the right(west) side of the road. What do you see that might be wrong with this picture? Not that it makes any difference, but I always regarded that path to be a bike lane, not a pedestrian route. I notice that adults on Stanford campus ride their bikes at godly speed. I hope the road conditions some times will not injure them. Do you realize you are precious, smart and you will be missed. This incident is a reminder. Do not ride so fast. Please! Tom You are correct - there are about 10-12 trees on that curve that block the view as you come down the hill and approach the area where the pedestrian path crosses the road. That woman should not have died because those trees should have never been planted there. The fix - remove at least 75% of the trees, it would be a good place for a crosswalk (because that is where pedestrians are forced to cross) and there should be warning signage (watch out for people walking across the street). I am struck by the vehemence of some statements. We don't know whether the victim was crossing or just walking at the side of the road and we don't know what the speed of bike was. The biker is the only witness and therefore his /her statements are a conflict of interest. He maybe truthful, but we are still confronted with the conflict of interest. Let forensics have a look at the occurence and conclude. By law, both pedestrians and cyclists are required to behave in a prudent manner. I can imagine the pain Mrs. Green's family is suffering but I can also imagine that the cyclist is traumatized. Let us leave it at that. ndh - there are other crosswalks on Page Mill - there is one near the PA Hills development. You need to look at where this accident happened - apparently right where one needs to cross the road to get to a continuation of the trail. Coming down from Foothills Park the trail is on the North side of the road but then it moves to the south side - that transition is at a curve where trees block vision and is cast a shadow on anyone walking across the road. And yes she was walking across the road. LawyerKnowItAll, Alphonso, and Tom - The answer is not to engineer the natural environment to suit the whims of yahoos who like to recreate their own little version of Paramount's Great America on the streets of my neighborhood. If anything should be banned from this beautiful natural environment, it's not the trees. And LawyerKnowItAll you are way out of line with your comments. The only one who thinks the biker was following the law is the biker himself, because the other witness to that event is dead. How ugly of you to blame the victim. I've ridden down on bicycles PMR-Skyline to 280 hundreds of times dating to the mid-eighties. It's a challenging road to both ascend and descend without question. That of course is much of its appeal. I don't think by and large most of the regular cyclists are operating their bikes in a responsible manner as you will pay a big penalty on PMR pretty quickly if you don't. The section where the incident occurred I'm usually traveling about 25 mph--so that sounds correct. I agree bicycles are silent and can sneak up on unsuspecting pedestrians or deer (a big concern of mine). I think the suggestions for using bells aren't practical because descending cyclists have there hands lowered into the "drops" of the handlebar for safety and control purposes and need both hands to steer and use the brakes--removing a hand to ring a bell could lead to loss of control. However while I don't know if it would have helped in this instance, I'm an advocate of using LED lights on bikes under all conditions--to me a surprising number of cyclists still don't use them and cyclists can be very difficult for anyone to see in shadows on PMR. My guess is the woman just wasn't watching or thinking about bikes and paid with her life. It's really very sad. It would traumatize me the rest of my life if it happened to me. The data, if you can follow me here, tell us that by the far the most common scenario --indeed virtually the only scenario with any frequency at all -- is a single bicyclist losing control of his bicycle with no outside help at all. Yes, all by himself, he wipes out. He swings too wide, he hits a rut, he wobbles onto the shoulder, he has an equipment failure. He completely misjudges a turn or his ability to take the turn. Every weekend the fire trucks roll up Page Mill. A quick check of broadcastify tells the story. So instead of surmising that the woman did something wrong and "paid with her life", the more likely scenario based on the data, is that the woman was in a location that should've been safe, but the biker lost control of himself and flew into her. You actually have a decent line of sight looking up Page Mill a this point. If, however, you walk 15 feet downhill, you are at the apex of the curve. It seems it would be MUCH SAFER to walk down 30 feet to get to the mid-point of the straight-away. I feel horrible for the woman who lost her life and the cyclist. 25 mph is not excessive speed - cars are certainly going this fast at around this turn. I am not trying to blame the victim, but I can't imagine anyone looking up the road at Web Link and seeing this an unbelievably dangerous place to cross - especially if you are not able to sprint across. As a cyclist that has done this route many times, it would have NEVER occurred to me that there might be a person crossing the street right at the blind curve. I will certainly slow down at this location going forward. Most every cyclist wants to be safe on the roads. It is so sad that it took a death at this particular location to bring a tiny bit of awareness to the danger. Without some actions taken such as making it clear to walkers to cross further down, remove trees, signage, etc., I am afraid the VAST majority of both car drivers and cyclists will have no idea of the looming danger of this one spot. If you are correct and the biker lost control of his bike in the turn, he would have been braking like hell. As such, there would have been skid marks the police would have seen. Given the police did not see any reason to blame the cyclist I would think there were no skid marks crossing over the divider line. Lastly, my comment above should, of course, read "but I can't imagine anyone looking up the road at Web Link and NOT seeing this an unbelievably dangerous place to cross - especially if you are not able to sprint across." I hope something good can come of this tragedy in terms of reducing the chances of it happening again. Please cite the California Vehicle Code section that requires bicycles to ride single file. As far as I have been able to determine, The CVC contains no such requirement. 1 - Many people cross Page Mill at that spot, and the fact and you and other bicyclists don't know this is just evidence that you're not really paying a lot of attention to your surroundings. Everyone who observes the bikes on Page Mill knows this. 2 - Of all the people who cross there, NO one walks 30 feet along the northern side to get to a "better line of sight". That's probably because: a) you can't easily get onto the pathway at that point because it's a steep descent down a bank; b) bikes are not the only hazards on Page Mill. Large trucks (cement, gardening, Park Rangers, school busses, and much more) have to pass each other in that narrow stretch of road and being on the northern side could force you up a slipper muddy hill. 3 - You write "I can't imagine anyone looking up the road at Web Link and seeing this an unbelievably dangerous place to cross." Saying that you cannot imagine something carries no weight. In your very next paragraph you share with us something that never would've occurred to you. So ... just sayin' your ability to imagine has no bearing on facts. 4 - The helpful suggestions of biker in this comment section has mostly been about how drivers and walkers can be more careful, or how the environment might be engineered so as to make their riding easier and safer. Are you not aware of how self-centered this sounds? The fact that so many commenters see bikers as selfish and dangerous should, maybe, tell you something about how you guys come across. 5 - Your claim that the biker would've been braking like hell and would've left skid marks is so implausible that one has to wonder if you take the intelligence of the rest of us seriously. There are numerous wipe-out scenarios that don't involve braking. As for the police blaming the cyclist, he obviously felt terrible plus he was the only witness left standing. His own memory was probably vague on the facts and strong on regret. Who's going to torment the guy? 6 - That particular corner has bumpy grooved pavement, a terrible angle of curvature, terrible banking, a ridiculously large curb the bike could've hit. There are a thousand and one ways the biker could've lost control without having done anything overtly "wrong". But to blame the victim for not crossing at the right place? Come on. A bike+biker is much harder to see than a car specially in certain bakgrounds. And as it has been pointed out, it makes little noise. So, even someone watching for incoming traffic might not see it. OH PPL, you amaze me. First of all, is this is simple, it is quite easy to control your speed/direction and always make at least a few escape routes (eg. checking for clear on coming traffic, then using that otherwise illegal route to move yourself out of the obstacle's way, while cornering). There is plenty of training and fun that takes place on the Page Mill decent WHILE watching corners (looking through trees, braking and positing yourself for evasion). I'm not sure of the specifics* and what that cyclist was thinking but this kind of accident could have avoided (less you want to miss quote me), more than likely. Should that cyclists be charged with a crime, no. The cyclist could have equally been have avoiding the pedestrian and just miscalculated and only have still ended up hitting said pedestrian (while trying to save both of their lives). What we should take away is that there is always a chance of loss of life. So many people forget cyclists are unarmored vehicles (paper missiles) that NEED visibility in order to survive. Like there is almost 100% chance that a cyclist who isnt triple checking traffic is at risk of death. You wouldn't think it would be hard to turn on your right indicator AND looking over your shoulder before merging right OVER the bike line to THEN making a turn. Literally that is the move I bet on cars performing while riding in THE LEGAL GREEN. So please have some patients while cyclists keep their visibility up and not follow the legal law to the letter. *and NO ONE WILL BE certain of what will happen (said God). You see eye witnesses (what we value so much) can all agree to disagree but there is nothing to be proven. Even our involved witnesses (even if the deceased party lived), neither could really fully explained what happened. We can guess but undoubtedly adrenaline was high and rational thought was well out the door. Like my first and upmost question, WHY was that pedestrian there? If only we had specifics but there is only one slightly 'blind corner' at 37.362901, -122.171808 that this could have taken place. I know this may sound callus but who was watching 100% of the time to see if there is on coming traffic IN YOUR LANE. This sounds like a highly unusually anomaly (the pedestrian's position in the road and choice of a ?crossing?). Do we know where exactly the pedestrian was struck and the exact line of the bike? (seconds before and after the incident)? I would be up with God on saying 37.362901, -122.171808 seems like the correct and only place this could have happened. So is the rider of the bike going to be charged with manslaughter? If a car had hit the pedestrian the driver would be charged as such. IMHO Bicyclists should not get special treatment. The path design that intersects the road is clearly a negligent design. Pedestrians should never be steered to cross at the apex of a sharp blind curve and DOT would never place a crosswalk in a location like that. ADA guidelines specify that you should never rely solely on audio information to be able to safely cross a road. Direct sight lines of traffic are always needed. This is even more critical now that electric and hybrid cars are becoming so popular, and the aging population's hearing is only getting worse. The immediate action should be to temporarily close that trail section before it heads into the turn. Then place a fence between the path and the road, wrapping around the end of the trail. Replicating the wooden fence on the park side of the trail for example. Then also placing 'dead end' signage. Rhus diversiloba planted on the other side of the fence near the end of the trail could be used an additional deterrent. Leaving the trail in its current state would be highly negligent. Tom - You seem like a nice fellow, but all of your suggestions relate to the "problem" of pedestrians in the road. You seem to miss the fact that anyone operating a vehicle at high speeds has the responsibility to be in control of that vehicle. That includes both the ability to evade contact and the ability to stop. Pedestrians do not jump out in front of cyclists (though squirrels and deer might). The more I think about this, the more I think the cyclist probably *was* at fault and is probably getting a pass because he feels bad. A walker is essentially stationary compared to a vehicle traveling at 25 MPH. The walker cannot be expected to leap out of the way of something hurtling toward them at 25 MPH. The "controls" are in the hands of the moving party, not the stationary one. If the moving party has exceeded his operating limits, it's on him. My dad was a pilot in the USN and commercially for nearly four decades. I remember after aviation accidents he used to scoff at the ignorance of the commentary of many laypeople. It wouldn't be possible to always be ready to stop on a dime on a bike (or car) while descending PMR. You'd literally have to be riding your brakes to the point the rims could overheat and you would also subject yourself to trailing vehicles catching up to you (which is never fun). This would be a completely paranoid style of riding and in my view far less safe than riding in a controlled, but confident manner at a reasonable speed. Would anyone advocate a national 35 mph speed limit for autos for all highways? I'd bet it could reduce fatalities, but somehow people would object because they believe that they can operate a auto safely at 65 mph depending on the situation. I still believe that Ms. Green was just at the wrong place at the wrong time. I'll restate that I do believe that cyclist should do a better job to be seen using lights during daytime. I also pay attention to all accidents I can read about not because of morbid curiosity-but because I can potentially learn from them and use the information to be safer. It's as likely as anything else that they both saw each other, realized the danger, and made avoidance maneuvers at exactly the same time ... and into exactly the same space. Who's fault? Both, in my opinion. Neither could see far enough around the curve to be 100% safe. 99 maybe, but not 100. What a horrible outcome. The sign coming into the hairpin from above says "BIKES SLOW -- SLICK CURVE AHEAD." I would make it yellow and say "20 MPH -- DANGEROUS BLIND CURVE." This is really very simple. California's Basic Speed Law says "Never drive faster than is safe." That means, you can't go faster than your ability to stop allows. When visibility is reduced, you must slow down enough to ensure your reduced visibility is compensated for so you can still stop in time to not cause an accident (with a vehicle, bicyclist, pedestrian, animal, or any other unexpected obstruction. This law serves to protect *everyone* from unnecessary accidents. I feel for the bicyclist, I really do, but that doesn't mean he is not responsible for traveling faster than was safe on this roadway. You can't fly down a road thinking that you are within the speed limit and therefore assume it is safe, or that you are not responsible for a subsequent accident because there was someone (or something) in the road that you did not expect to be there. Perhaps the best outcome is that this bicyclist is sentenced to a lot of community service hours specifically geared toward sharing his experience in this case and helping others to learn that they are responsible for the "vehicle" they operate. Maybe, but not likely. The bike was traveling at 25 MPH, the pedestrian at maybe 2-3 MPH, and they were traveling perpendicular to each other. The responsibility to avoid the accident was on the bicyclist, whom should have been able to swerve (most likely to his left) to avoid the collision. There is no reason a bicyclist (or car) should hit a pedestrian unless they are traveling faster than is safe for the conditions. If this was a blind curve, the bicyclist should have slowed way down. Again, I feel for the bicyclist, but feeling bad for him does not remove responsibility. @Um, No -- just one day previously, there was a pedestrian fatality on 101. Web Link Do you hold the truck driver responsible? The CVC section that requires that bicycles ride sinvle file is 21202. It doesn't apply to bicyclists who are riding as fast as the general flow of traffic. @musical: Yes, for the same reason. First, thanks for using your name. It is so disappointing to me that many folks think we can have a meaningful/helpful dialogue while hiding behind anonymous names. IMHO, it just drives very bad behavior. Couple of comments. If the accident did take place at the hairpin near the park entrance AND the biker was going 25mph, he was totally out of control. At that speed he would have crossed the double yellow on a line that put him near the sign warning about fire danger level - seeWeb Link. I don't think this is where the accident took place b/c I 100% would agree the biker would have been 100% at fault and should be charged for not operating his bike safely given he crossed the double yellow. 1) No biker would ever take this turn at 25mph (even the MOST aggressive bikers that are getting a lot of scorn here know they would be thrown from their bike at this speed. 2) The biker was not cited. Seems the police would have been able to determine that he crossed the double yellow and that 25mph was unsafe. 3) Much less likely the pedestrian would be crossing here. There is no reason to given there is a walking path right where the fire danger sign is. So if we say the accident took place at the Web Link, I want to point out there is not a single sign or indicator to reduce speed or that a turn is coming up. Take a look at Web Link and see there is nothing to indicate that a turn is even coming up. So, I agree there should be something to indicate to drivers (both car and bike) that a turn is coming up. So, if the accident occurred here and the biker was going 25mph then it's hard to see how we can blame the biker. Again, he was travelling at a normal speed for this road and had no warning/indication that there may be a pedestrian in the road. Of course, he tried to avoid the collision and likely guessed wrong about where to alter his course when he saw the woman. OK, now on to JaysNotaDope. I don't know who you are but my guess is you have had some bad encounters with cyclists. If so, I am sorry. You may not want to believe me, but there are many of us who bike who are nice people, have kids, are concerned about our safety and the safety of others. In fact, most of are constantly on guard to avoid being stuck by a car. 1) This is a very dangerous location with no signage whatsoever to warn cars/bikes that people may be in the roadway. You reprimand me saying "the fact and you and other bicyclists don't know this is just evidence that you're not really paying a lot of attention to your surroundings. Everyone who observes the bikes on Page Mill knows this." I am actually hyper vigilant about my surroundings. The fact that I have rider by this spot numerous times and never seen a pedestrian crossing is not an indication that I am not paying attention. It's an indication that the people crossing are infrequent compared to road traffic. 2) You belittle my suggestion that 30 feet down provides a better line of sight. I said this b/c it seems that if a crosswalk were added it would be safer down the street as opposed to right where the turn occurs. You write, "Large trucks (cement, gardening, Park Rangers, school busses, and much more) have to pass each other in that narrow stretch of road and being on the northern side could force you up a slipper muddy hill." There is a white line that separates the road - see Web Link. Again, I bring this up as a suggestion around safety. I have never crossed Page Mill at the spot where we believe the accident occurred (just as I suspect you have never ridden a bike down Page Mill). All I can say it that I personally would not cross there given what I know about the flow of traffic and limited visibility. 3) "Braking like hell" - Please understand that every biker (even the most aggressive/crazy) has there hands on their brakes for this descent the whole time. You are breaking on and off continuously. For some reason, I assumed the woman was walking down from the Park - so crossing from Left to Right from the bikers perspective. We don't know where she was when the biker saw her. My point was that if she was on the Park side and starting to cross and was struck there, the biker would have crossed the double yellow (a clear sign he was out of control). All I can speak to it my own experience coming across squirrels or other objects in the road, but if I am going 25mph downhill I already have by hands on the brakes. If I see something, my first instinct is to reduce speed. In this case, it just seems likely to me that a skid would have occurred under the scenario the biker was going too fast that he was not going to make this turn AND saw his path was going to take him across the double yellow and into a person. I do "take the intelligence of the rest of us seriously," I am just trying to share my opinion based on my own biking experiences. If we assume the biker DID not cross the double yellow and the impact happened closer to other side of the road - maybe where the P is in Page Mill at Web Link then this is just a sad tragedy of the biker having no way of knowing a person might be in the road, traveling at a safe/normal speed for that turn, and the walker being in an unfortunate place (totally unseen by the biker and visa a versa until micro-seconds before collision). You write at the end, "But to blame the victim for not crossing at the right place? Come on." I am not blaming the victim. It seems she was victim to really poor planning on the part of Palo Alto and Los Altos Hills about where a walking path starts and stops. I don't fault her in any way for crossing where we think she did. That I would not cross there does not mean I am blaming her for doing so. I just want to close with an admission that we don't know the facts here. It very well be the biker was out of control (i.e. his breaks could have failed or he could have hit a bump and was in the process of falling off his bike, etc.). Without having the facts of precisely where the accident took and the movement conditions of both biker and walker we are left to speculate. All we can conclude it that is is a VERY DANGEROUS place to cross the street and based on lack of signage most drivers/cyclists (even one's like me that are always looking around at surroundings) don't even realize there is a potential for someone to be in the street when they make that turn. Regardless of whether new information comes to light telling us more about the biker and the walker's actions, we should all agree that something should be done to improve the safety going forward. While more complex suggestions can be debated and implemented, I am happy to take a first step and place a placard similar to the one before the hairpin before Park entrance to warn people their is a blind curve ahead. I will try to get to that over the weekend. Actually I'm surprised the cyclist has not been cited in that accident. If he states he was doing 25 MPH, then he was doing almost twice the posted speed. There is a 15 MPH sign right before Central Drive coming downhill. Gregory P. Smith is a registered user. The 15 MPH sign is yellow. That makes it advisory, not the limit. Posting a different speed limit sign or putting a stop sign around a blind corner with a cross walk would do nothing to prevent incidents on this road (a stop sign would actively _cause_ them). The best thing is to avoid encouraging pedestrians to mix with traffic in unsafe areas by design. Greg, if cyclists aren't able to use advisory information for the safety of themselves and others, then there is a problem. Accident rates tell us that cyclists have a relatively high probability of losing control on Page Mill. Higher than cars and a lot higher than pedestrians. I think some recognition of this problem by the biking community and some suggestions for how to address the problem with education and efforts at self-policing, would be welcomed by all. Thanks for clarifying the location. I still think of it as "Eucalyptus Curve". The road was built around a big old tree and a building (both gone now), and is awkward and dangerous. Even in the streetview photo, it's obvious that the "path to nowhere" gets a lot of use. Foothills Park is available to all comers most of the time and walk-ins all of the time. Palo Alto and Los Altos Hills need to cooperate to create a better solution for pedestrians there. A tunnel would be perfect. roadway so near as to constitute an immediate hazard. brkaplan is a registered user. We are neighbors in Barron Park. My main concern is safety and thinking about how to avoid a similar tragedy in the future. One thing I want to point out is that the 15mph advisory is placed at the first curve to the left. It is a MAJOR flaw that there is no signage about the turn to the right that follows. Evidence suggest this is where the accident occurred. You have completed the curve, so would assume it's safe again to travel at 25mph. If there were only one sign, it should definitely have been placed to warn of the upcoming RIGHT curve given this is where people might be crossing. I have been beaten up by Fred (aka JaysNotaDope) about how ignorant I am that I did not know that particularly spot was a place where people walk across the road. Both my wife and I are have been on Page Mill heading up to Foothills probably more than 200 times over the past 18 years of living here and NEVER ONCE SAW A PERSON walking across Page Mill where we now think the accident took place. See Web Link starting at 13:42. I suggest not watching the whole video as it will only rile people up about this one case of a biker going way too fast down PMR. It riles me up. OK, let's review what we know. 2) There is NOTHING to indicate this is exactly a place where a walker trying to get up to Foothills Park may be crossing the road. Given this, it's a hard to fault anyone for going 25mph around this curve - cars or bike. Only if you found out this was a place where people walk across, would you expect the driver/biker to exercise caution and slow down to say 15mph. My concern is safety. Sadly, it seems Fred's objective is to belittle me and criticize the biking community. Of course, this would take time/money/ and may involve property rights of the person that lives in the house up the hill. This property falls in Los Altos Hills so it would need to be taken up with their city council. My final comment is that we don't know all the facts surrounding the accident that led to this tragic death. If it were the case the biker was actually going more than 25mph, I would 100% agree he bears responsibility. All we know for sure is this is a VERY DANGEROUS situation. Although Fred asserts this is "famous on PMR for causing bike and auto accidents," I am convinced that 99% of people (who don't live in this area) have no idea NO IDEA of the dangers of this one curve. I think there is much we can agree upon. Yes Fred made some heated remarks but I think the residents of the area, with some justification, do not like to think of their neighorhood as a recreational park for thrill seekers. I know I would not appreciate having bikes or cars driving the streets of Barron Park at "recreational" speeds. Barron Park is a quiet little place where children are relatively safe and no one -- cars or bikes -- feels a need to fly around curves and blow past intersecting streets. The residents of LAH feel that their neighborhood and its walkers and horses and children, should be treated with the same respect. Moreover, the problem of arrogant bikers is of long standing and is well known to us all. So when someone actually gets KILLED by a biker then maybe a little humility is in order. If I were a LAH resident I'd probably be working right now to ban bikes from PMR altogether and have done with it. I used to ride PMR but was not much of a yahoo even at my peak and about 20 years ago decided it's too dangerous to be worth it. Any inattentive driver or teenager learning to drive could reach for a hanky and knock you right over the side, you know that right? The area in question is probably THE most heavily used part of PMR by pedestrians because of Foothills Park and the confluence of several LAH pathways. A tunnel or ped bridge would be very cool. Someone posted here that it's a rich community and should put some money into making its infrastructure safer for all. Makes sense to me. HelenB is a registered user. I am still tabulating my results from radar-checking the downhill traffic. If you have suggestions for how best to share them, let me know. I have an update for you on the use of the path. About 30 minutes after we spoke, my husband joined me and he agreed with you and me that crossing Page Mill from east to west, at that point, is very dangerous. But 15 minutes after he went home, a couple with a dog walked up and told me they cross that way frequently. They're aware of the poor visibiliity but feel they can handle it safely. So someone needs to study how many people actually cross Page Mill there. When I arrived, there was a local resident doing a radar gun study for downhill traffic coming into the curve. She was marking speeds for cars, bikes, and motorcycles - which is great. I got off my bike to take a look at the area. It is pretty clear the accident took place as the walker was crossing the street heading towards the path that takes one to Foothills Park. I say this after standing on the Foothill path side. There is actually really good line of sight there. You can see about 200 feet up the road and 200 feet down the road. Crossing going from the Foothills side is actually pretty safe. It is just the opposite on the other side. There is a place between two smaller trees where it's clear that people have walked. It doesn't show well at Web Link but it's clear when you stand there. I wish I had taken a picture. Will do so, next time. Your sight is almost entirely blocked by the large redwood tree. The woman with the radar gun was willing to make sure nobody would cross the street, so I decided to do a couple of speed tests. First, I took the curve at 25mph. It was in no way unsafe - meaning I was in complete control of my bike and in no danger of crossing the double yellow. I did this again at 27mph and 30mph. In all cases, I never felt I was in danger of losing control of my bike or crossing the double yellow. Yes, there are larger issues of people going too fast down PMR. This includes cars, motorcycles, and bikes. Kids are not playing ball or people walking dogs on PMR as they do in Barron Park. Speed limits are established for a reason. Going above the speed limit typically implies unsafe driving, so of course, I would be annoyed/concerned if people were speeding through Barron Park. In this particular tragic case, the biker (if we accept his account) was going the speed limit. The walker, it seems made a bad choice to cross the road at a place where there is no warning for drivers to slow down and there is about 10 feet of visibility. I think the cities of LAH and PA bear some responsibility for not putting a warning not to cross at the particular spot on PMR. I am not sure what you mean by showing "a little humility." I have expressed deep remorse for this tragic loss of life. I truly hope something can be done to make this less likely to happen again. I have also admitted there are some bikers that travel too fast down PMR. Just as there are cars and motorcycles going too fast. After going to the site and looking at the situation, I am convinced the way to prevent this particular accident is to prevent walkers from crossing uphill at this spot. Even reducing the speed limit to 15mph around the turn will not eliminate the danger if someone is in the road. I've been confused and curious about this since I read about this accident. dangerous, or not, area, is a bad way to set policy on this. speed limit, in my opinion is going to be joyriding for bikes. same PALY died going off an embankment. to be riding for fun. How much fun justifies someone dying? face they need to in order to justify continuing their sport. But the city roads of Palo Alto are not a sport. on turns and patrol the area. bike and you are dressed and mentally set for the Tour De France. It is the bicyclists that bears the burden for this accident. if he was traveling at designated speed ... it appears to me. willing to enforce, don't bother. the individual than that did. BTW I have it on good authority that bike speed distributions on a Sunday afternoon might look different than those on a weekday morning. I'll do this again at different days and times. Helen, did any of the motorists see you before you could radar them? drive it is usually higher than the posted speed limit. A. That motorists and bicyclists saw you and slowed down. this case I would say around 20 MPH. It was a pleasure to meet you and see a concerned resident taking action as well. Very very interesting to hear of "a couple with a dog walked (saying) they cross that way frequently. They're aware of the poor visibility but feel they can handle it safely." Thanks again for the radar gun study. The accident happened downhill from the Foothill Park entrance, at a spot where the road narrows and takes a nearly right-angle turn. There's a pathway out of Foothills Park that stops right there. As Brian points, out crossing from the Foothill Park side gives good sight distances in both directions whereas crossing from the other side leaves you quite blind on the uphill side. Whether the accident was due to bicyclist going too fast or walker stepping out incautiously, I think this tragedy has rightly called attention to traffic issues on Page Mill Road. It seems that after 12,000 views and 90 comments, the energy/interest in this tragedy (at least in the online forums) has moved on to newer issues. I do hope, however, this is looked at as a safety issue by Los Altos Hills and Palo Alto City Councils. I was up at the site yesterday and placed a warning sign to alert walkers of the dangers of this one spot. I came across a local resident who has made this crossing before on her way to Foothills Park and was surprised to learn just how dangerous it was from a visibility standpoint. In most cases, you can hear a car or motorcycle coming down the road. Bikes, of course, are much harder to hear. There is no doubt accidents will continue to occur on PMR. It a beautiful road in a beautiful place that attracts bikers, motorcycle riders, and cars on weekdays and more heavily on weekends. There are also hikers who are accessing Foothills Park who don't drive to the park. I do hope that when the next accident occurs, concerned citizens take the time to gather all the information possible and resist pointing fingers/assign blame and attacking each other. We don't learn much about how to make the situation better when we are this mode. Thank you for all of your effort to warn pedestrians of the danger. Would you please also acknowledge that with the limited visibility (per your presentation, less than one second of reaction time) that 25 MPH is too fast for any vehicle to be traveling at that particular location? Even down the road, a pedestrian has no hope of getting out of the way of a vehicle traveling 25 MPH - the vehicle has the responsibility to not run into anyone or anything on the road. A bicyclist should at least be able to swerve to avoid an object, even if they can't stop. What if the object was a broken down vehicle, or another bicyclists stopped or injured? It would be the bicyclist that was dead, right? I am concerned that this thread seems to want to give bicyclists a pass on their responsibility as vehicle operators, and put all of the responsibility on pedestrians, and that is not reasonable, nor is setting that expectation going to help us save the next person. Maybe next time it's a group of kids that lack the experience to heed your signs? Or someone who doesn't speak English? 25 MPH is too fast for any vehicle to travel around a blind curve. Period. Here is the problem. You and I know this is a dangerous blind curve. Many people have had there awareness raised given the tragic loss of life. I have been up to Foothills Park about 200 times. I was aware that this was a turn to the right and have taken the turn at 25mph on my bike, my motorcycle, and my car without ever even considering that person might be in the road. I am sure most people would not have any inkling that the possibility exists that a walker may be in the roadway. The speed limit is 25mph and there is not even an Advisory sign showing a curve to the right with a recommended speed of 15mph. So, how would someone driving this turn for the first time have any chance of knowing to slow down? They wouldn't. In addition, you may firmly believe that 25mph is too fast around a blind curve, but there is no issue staying in control of your car, motorcycle, or bike at that speed. The danger only arises if something (a deer, person, stalled car, etc.) is in the roadway. The reality is that people will certainly continue to take that turn at greater than 15mph (even if there is an Advisory sign put up). I don't have the power to put up an Advisory sign. All I can do it try to warn English speaking walkers of the danger of crossing right there. Of course, the only reason to cross comes from local Los Altos residents going up to Foothills Park. Yes, they shouldn't "technically" be entering the park, but the reality is they will (I don't blame them - Foothills Park is amazing) just as the reality is that people will continue to travel at least 25mph around this curve. I think the biggest danger comes from motorcycles, car, and then bikes traveling above 30mph around the turn. If we can reduce the risk of a person being in the roadway, then, if there is an accident (such as a deer in the road), the person who is most impacted is the driver who was going too fast to avoid the object. As I said, I do hope the issue is taken up first by Los Altos City Council and then Palo Alto as needed. The responsibility of all vehicle operators is to not drive faster than is safe. That is California's Basic Speed Law. Vehicle operators should not need to rely on signs to tell them they have limited visibility. Signs are great, when they are there, but the absence of them does not make it OK to fly around a blind corner, hit someone or something, and then say, "I was going the speed limit and there was no sign warning me that I couldn't see around the corner. So it's OK, right?" If you can't see far enough ahead of you to avoid a collision, YOU KNOW YOU ARE GOING TO FAST. You don't need a sign to tell you that. If bicyclists cannot stop quickly, that's all the more reason they need to travel more slowly. If that makes PMR less fun, so be it. Safety is more important than a few people's extreme fun. Operating any kind of vehicle is a responsibility, not an entitlement. If you can't control the vehicle enough to avoid an accident, you shouldn't be operating the vehicle. I think we are going to just need to disagree and leave it at that. You seem convinced that, at 25mph, one would "fly around a blind corner." IMHO, 25mph is not unsafe around this turn; this is especially true if you have never taken this turn. The exercise caution element really comes into play with road conditions. For example, if a torrential rain was occurring or fog, drivers MUST adjust their speed to account for these CHANGED conditions. I took the turn at 30mph on my bike easily when HelenB was there doing a radar test. You are making an argument that extends such that anytime a driver strikes anything in the road (like a squirrel) they are guilty of operating their vehicle in an "unsafe" manner b/c, by your definition, they should have been able to avoid the object. The fact they were not able to avoid the object does not necessarily mean they were operating in an unsafe manner. It could mean an object was present on the road that was unexpected. This, in my opinion, is exactly what happened. The biker (if we accept that he was going 25mph) was going the speed limit and had no way to expect anyone was going to be in the road. This, it seems, is exactly why the police did not cite the biker. Police, who enforce our speed limits, are very concerned with safety (given all the horrible stuff they need to deal with related to driving). I would think they would be inclined to cite the driver/biker, if they believed the person was, in fact, operating their vehicle in an unsafe manner. New facts may come to light that would have me alter my conclusion. In fact, the family of the deceased could file a civil case against the biker. If this occurs, the the question of whether biker was operating in an unsafe manner will be central. If I learned something like the biker was checking his phone at the time, etc. I would conclude "unsafe" but with just 25mph as data, I just don't come to the same conclusion you have. Reasonable people can disagree. I want to end with where we do have agreement. We both want to see reasonable steps taken to reduce the chances of this type of accident occurring again. My look at the details and the crash site itself, leads me to conclude that the most effective way to prevent this type of accident is to reduce the likelihood that a person would be in the road. If people think that a solution to reduce risk must also include speed being reduced, then the only way to bring this about would be to reduce the speed limit to something like 15mph. Unless that occurs, there is nothing that will change relative to the speeds. A radar study done today will have the same results as one conducted a year from now. You may want to say that everyone that takes that blind curve at 25mph is operating their vehicle in an "unsafe" matter but, I would ask, "to what affect?" I will continue to drive down PMR and will always think twice about my speed as I enter this turn, but I am just one driver of thousands that make this turn in a given week - most of whom will never have heard that a person died around this turn in April of 2015. Thanks for engaging on this very difficult subject. I appreciate your civil engagement in this conversation. And yes, we may have to agree to disagree. To be clear, my objective is not to vilify the bicyclist in this case, or advocate for a civil case, but only to ask that all "vehicle operators," including bicyclists, think about their responsibility and ability to prevent a disaster. California DMV Code does not give a pass for hitting people or things that are "unexpected." It does direct that vehicle operators must not operate their vehicles in an unsafe fashion, including traveling faster than that which ensures safety in a reasonable situation. We are talking about stopped or slow-moving objects, pedestrians (including children), fallen cyclists, broken-down cars, etc. A "vehicle operator" must be able to stop within the stopping distance defined by their: visual perception, reaction time, and vehicle speed. That is a complex set of requirements for all vehicles, but it is one that is meant to keep everyone safe. It may not get you to your destination in time, and it may not be as fun and exhilarating as going as fast as you can physically manage, but it keeps everyone safe, if we adhere to it. Once a week I have to travel into the hills, and I am often on a time crunch to reach my destination on time, and am always anxious to get home as soon as possible afterward. But I never risk sacrificing the safety of the bicyclists I encounter going up, nor the unexpected encounters I may have going down (in the dark, with only my headlight distance to illuminate the road). The posted speed limit is 35 MPH, but I rarely reach that speed because it is just not safe to do so with the many twists and turns in the road. I have had to slow to 5-10 MPH for significant distances because I could not "safely" pass a bicyclist lumbering up the hill without risking a head-on collision from vehicles coming down the hill. I do not travel 35 MPH down the hill in most places because that speed does not allow me enough stopping time, even with my "bright" lights on. I also lived in the hills for seven years, so I know this drill very well. I'm not looking for a pat on the back, just asking everyone to SHARE THE ROAD - CARS, BICYCLISTS, AND PEDESTRIANS (I would include animals but I hear they don't read PAO). Public spaces and roads prioritize keeping everyone safe, not maximum fun and exhilaration. Which reads (in part) "Another example of municipal negligence might be a poorly placed crosswalk. Let’s say that there is a crosswalk right after a curve on a busy street and that there is no street sign in place to alert oncoming drivers that there is a crosswalk coming up right after that curve. That is a poor municipal planning, and it has created a safety hazard. Drivers will come whipping around that curve never knowing there is a marked pedestrian crossing coming up very quickly. Learn more about Government Responsibility to Maintain Roads." I am not a lawyer but I actually think the biker and the pedestrian could make a claim against Los Altos Hills for playing a role in this accident. Be Kind PA, it seems, you would maintain that the pedestrian's family has a claim that would assign fault to both the city and the biker. Here we would disagree. I assert that the biker has a claim against the city and the pedestrian as both contributing to this accident. "All drivers are responsible for driving carefully under the given circumstances. In the realm of personal injury law, this responsibility is called a duty of reasonable care or due care. The driver is held to the standard of what a normal, careful and prudent person would do in the same circumstances." People will differ on what "a normal, careful and prudent person" would do as they approach that turn and what they would do upon realizing a person was in the road. I know there are speed junkies that drive PMR way too fast. As a biker, this is my greatest fear. But I am also a driver. I see going 25mph around this turn to be what "a normal, careful and prudent person" would do. I see going 30mph as something that imprudent person would do. I also think a reasonable person, like PA Be Kind, might conclude that going 25mph is not something a "a normal, careful and prudent person" would do. We know accidents will continue to happen. This is an unusual circumstance in that it involved a pedestrian and a biker-but could easily happen again. More common are cars hitting motorcycles and bikers. In these cases, regardless of who is at fault, the riders typically suffer much much greater injuries than the drivers. I agree 100% everyone should exercise more caution on Page Mill Road. Many people love it because it has twists and turns. For this very reason, it also presents extra dangers. I was up biking by Page Mill yesterday. Turns out, someone was not happy with the warning sign I placed to make sure pedestrians knew this was a dangerous blind curve. So, the warning is now gone; we are back to the exact conditions that existed before the death on April 22nd. Makes me sad. I do hope the LAH town council takes a look at this issue. I am not going to place another warning sign as it seems likely someone will just take it away.